“That’s how you find out about auditions,” his mother, Laura, explained. Terren was two when he saw his first live show, the CLO production of Peter Pan. He never squirmed or kicked the seat in front of him. His eyes tracked every action onstage. Afterwards his parents took him around to get the child performers’ autographs. He was hooked. The following year the family of three became season subscribers and has been ever since. sixth-grader at Palos Verdes Intermediate School. Earlier this year he thought he had missed his shot to appear on the historic stage with John Larroquette (“Old Max”). He got another chance, but not through the usual audition route. Terren remembers sitting on a stepstool watching the dancers and wondering, How do they do that? Although becoming a gumdrop was easy as pie, Terren wanted to gear up for greater challenges. He plunged into ballet, jazz and tap at the San Pedro City Ballet. When he was around six he joined a hip-hop class. “You were supposed to be 12, but I fit in,” he said. Now he studies dance in Orange County, as well as dance, acting and voice at the Professional School for the Arts in Torrance. “I’m stronger in singing and acting than dance.” He’s beefing up his dance training in anticipation of dance-intensive roles in some of his favorite musicals, “Billy Elliott” and “West Side Story” when he’s 15 or 16. Somehow he manages to squeeze in Boy Scouts, clarinet and keyboard, as well as soccer, basketball, water polo or skiing (depending on the season). And get straight A’s in school. For relaxation he likes music, movies, video games, reading, “hanging with friends” and playing with his cat, Leo. When does he sleep? He admits to catching a few Z’s in the car as his mother ferries him between classes, rehearsals and performances. Terren made his professional debut at age eight with a small part in “Oliver!” at the CLOSBC. Since then he’s been in twelve shows. Rehearsals take four weeks, even for single-weekend shows. Playing the same role, the Phantom of the Opera as a boy, in four different productions gave him some breathing room, though. This year he also appeared in “Oliver!” — in the title role — at Crescendo Theatrical Productions in San Dimas. 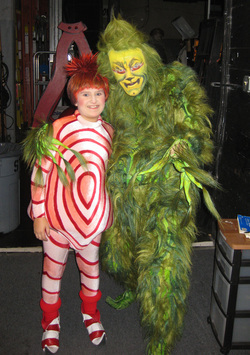 Here’s the story of “The Grinch That Almost Wasn’t.” Terren auditioned for the Pantages production, but after a few callbacks months went by without a word. He assumed he was out of the running. Then his agent told him about a video competition to cast the one remaining Who. Terren’s video was among 175 submitted. A few weeks later he learned he was one of five finalists. “I was like, Oh, my God. This is it. Live TV. Play it cool, “ Terren recalled. After the five youngsters sang and danced “You’re a Mean One, Mr. Grinch” they were escorted into another room to await the decision. Finally a girl named Isabella and Terren were called out. The rest hadn’t made the cut. Would Terren and Isabella duel to the finish? No. They both had been cast. “We were so happy. [The TV reporter] interviewed us for a while. Then the paparazzi were swarming around us,” Terren said. Rehearsals at the Pantages were intensive and rigorous – four weeks of nine-hour days, six days a week – even though “child wranglers” were always on hand to make sure the young performers got sufficient hours of backstage schooling and onstage work, but no more than allowed by law. "At first I was really nervous about working with John Larroquette,” he said, “because he is really famous, but then I thought that I should just treat him like any other person so I started talking to him and now we like each other a lot. He is really cool. Stefan [Karl, “The Grinch”] makes extremely funny wisecracks backstage and is indescribably funny. He is really nice to all of us kids, as are all the actors. And I've never met anyone from Iceland before so I think that is very cool." His PVIS classmates are excited about Terren’s success. They watched his live TV audition in class. “Everybody was swarming around me, asking me questions. They were asking for my autograph. A girl had me sign her shirt with a Sharpie,” he said, rolling his eyes in amazement. When his friends come to see the show he’s allowed to take them backstage. They are thrilled to be behind the scenes at the famous theater, seeing the costumes and wigs all lined up in a row. Before each performance make-up artists, dressers and hairdressers buzz around the child actors for nearly an hour, readying them to go onstage. In his Danny Who wig Terren looks as if a giant, neon-red sea urchin has made a home on his head. It’s a wig worthy of one of Terren’s favorite performers, Lady Gaga. Terren was surefooted in his elfin boots as he scampered onto the Pantages stage for the first performance.